The part BBa_K2205018 was designed as Reporter unit of the Sensynova multicellular framework for biosensors development(Figure 1). This part was made to test the modularity of the system by replacing the sfGFP reporter module of the Sensynova platform design with the chromoprotein variants spisPink (BBa_K1033925). The spisPink protein is a pink chromoprotein extracted from the coral Stylophora pistillata. It was first extracted and characterized by Alieva et al. under the name spisCP (GenBank: ABB17971.1) and codon optimized for E. coli by Genscript. The protein has an absorption maximum at 560 nm giving it a pink colour visible to the naked eye. 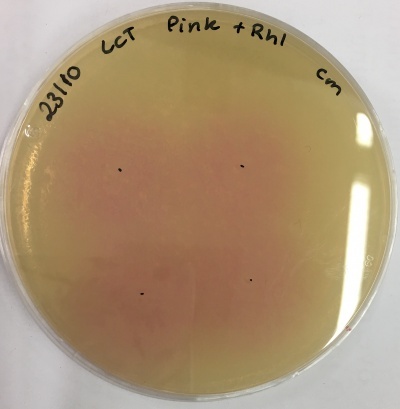 The strong colour is readily observed in both LB or on agar plates after less than 24 hours of incubation. The part BBa_K1033925 is under the control of our connector 2, part BBa_K2205013, meaning it is normally repressed except in the presence of connector 2 (C12 – RHL). In order to test this chromoprotein reporter variant into the Sensynova framework, cultures of IPTG detector, processor unit and reporter module were inoculated and grown overnight in LB+chloramphenicol (12,5ng/μl). The cultures were then diluted at OD600: 0,1 and mixed together to obtain co-cultures with ratio 1:1:1 and 1:1:13. Some samples were supplemented with 1mM IPTG to induce the expression of quorum sensing molecules and eventually achieve the chromoprotein visualisation (Figure 3). Figure 3: Pellets collected after overnight co-cultures of IPTG + processor + Pink Chromoprotein reporter in ratios 1:1:1 and 1:1:13, with and without 1mM IPTG.